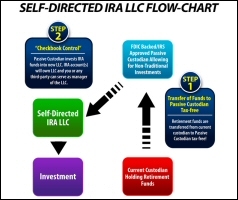 How Does a Self-Directed IRA LLC Work? 1. Set up a Self-Directed IRA LLC. With IRA Financial Group, you no longer have to spend $2,000 to $5,000 or more to set up your Self-Directed IRA LLC. The IRA Financial Group will take care of the entire set-up of your Self-Directed IRA LLC “Checkbook Control” structure. The whole process can be handled by phone, email, fax, or mail and typically takes between 7-21 days to complete, the timing largely depending on the state of formation and the custodian holding your retirement funds. Our IRA experts and tax and ERISA professionals are on-site greatly reducing the setup time and cost. Most importantly, each client of the IRA Financial Group is assigned a tax retirement tax professionals to help with the establishment of the Self-Directed IRA LLC “Checkbook Control” structure. You will find that our fee for this service is significantly less than other companies that perform the same or similar services. Our IRA Experts will assist you in transferring your retirement funds tax-free from your current custodian to a new FDIC backed/IRS approved Passive Custodian that allows for truly Self-Directed IRA investments, such as real estate, tax liens, precious metals, and much, much more. What is a Passive Custodian? The IRS approved and FDIC backed custodian in the “checkbook control” Self-Directed IRA LLC structure is referred to as a “passive” custodian largely because the custodian is not required to approve any IRA related investment and simply serves the passive role of satisfying IRS regulations. The passive custodian business model is built around the establishment and maintenance of IRAs, whereas, a traditional IRA custodian generates income through the marketing and sale of investment products. All the passive custodians we work with are FDIC backed and IRS approved. Once your custodian has transferred your retirement funds to the passive custodian, the passive custodian will immediately transfer your funds to your new IRA LLC where you as manager of the LLC will have “Checkbook Control” over the funds. With a Self-Directed IRA LLC with “checkbook control” you no longer have to pay excessive custodian fees based on account value and transaction fees. Instead, with a “checkbook control” Self-Directed IRA LLC, an FDIC backed IRS approved passive cust odian is used. By using a Self-Directed IRA LLC with “checkbook control” you can take advantage of all the benefits of self-directing your retirement assets without incurring excessive custodian fees and custodian created delays. Open a local bank account for the LLC at any bank of your choice. You can open a bank account for your Self-Directed IRA LLC at any bank or credit union. Direct the passive custodian to transfer the IRA funds to your new Self-Directed IRA LLC bank account. The IRA LLC checking account can be opened at any bank or credit union. As the Manager of the Self-Directed IRA LLC, you will have the freedom to make all investment decisions for your Self-Directed IRA LLC. In other words, you will have “checkbook control” over your IRA funds allowing you to make an IRA investment by simply writing a check or wiring funds directly from the IRA LLC bank account. Since your IRA will become the owner(s) (member(s)) of the newly formed IRA LLC, all income and gains generated by an IRA LLC investment will generally flow back to your IRA tax-free. Because an LLC is treated as a pass-through entity for federal income tax purposes, all income and gains are taxed at the owner level not at the entity level. However, since an IRA is a tax-exempt party pursuant to Internal Revenue Code Section 408 and, thus, does not pay federal income tax, all IRA investment income and gains will generally flow through to the IRA tax-free! For more information, please contact an IRA Expert @ 800.472.0646. Previous Previous post: Using a Solo 401k Plan, what transactions may trigger the UBTI tax?